New for 2019! The smallest and lightest of the ProTech Series, the brand new Sibley 300 ProTech measures 3m (9ft 10in) in diameter with 7m² (75ft²) of floor space. Relying on a sturdy steel tri-pod pole system to maximiize useable space, the 300 is the perfect canvas tent for 2 people on a double matteress. No center pole to work around! Water and vapor impenetrable ‘bathtub style’ floor rises 10cm (4in) high to keep you dry even in standing water. Door gussets lay flat to prevent tripping, facilitate easy cleaning, and provide electrical cord entry. Pro grade canvas is waterproof, durable, and exceptionally breathable. A true 4 season tent - the 300 ProTech is equipped with a 360° mesh wall for maximum ventilation in hot buggy weather, which can be rolled up and stored or removed completely in minutes when the temperature drops. Following the popularity of the Sibley Ultimate Series cotton canvas bell tents, we received requests from customers seeking all the same luxurious features but in a heavy-duty package for more demanding applications such as multiday festival camping, glamping, tent rentals, basecamps, bushcraft shelter, survival, long term use, and extreme weather conditions in all 4 seasons. In response to those requests, CanvasCamp returned to the drawing board and developed the ProTech Series. The floor is thicker. The canvas is more durable. The poles are stronger. Even the screen material, guy ropes, and stakes are beefier. To top it off we’ve added a zip in/out mesh sidewall and sewn in screen door for maximum ventilation and bug protection. These exclusive features and improved materials have made the CanvasCamp ProTech series the highest quality and most popular Sibley tent to date. 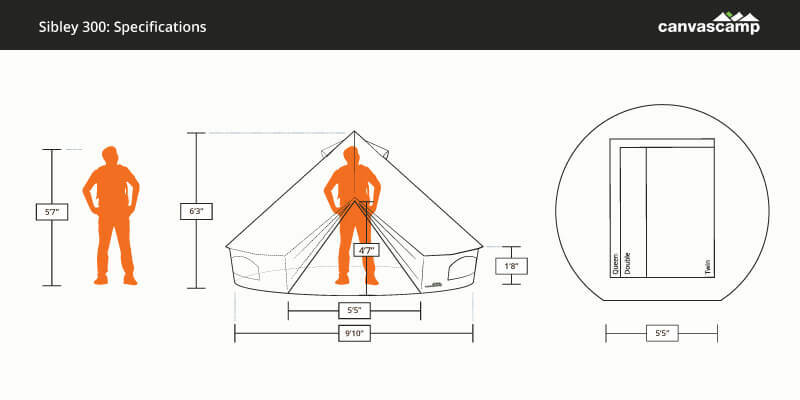 To maximize useable space in our smallest Sibley we’ve designed a tri-pod pole system instead of the traditional center poles available on our larger bell tents. The 10 piece frame is spring loaded for easy set up. Each leg of the tri-pod is comprised of two pole sections which attach to a 3 pronged peak piece. Rubber pole feet protect the tent and floor from the pole ends. Although the 300 isn’t as easy to pitch as the 400 or 500 with their single center pole, once up this little guy is as tough as they come; wind tested to 120kmph (75mph). The top of the A-frame door is equipped with a pin that sits in a grommet at the peak of the door ensuring proper placement. A rain cap is then placed over the pin and grommet to keep rain from running down the poles. The canvas door zips together vertically and along the bathtub floor. Each side of the door is equipped with loops and ropes to neatly tie back the canvas doors to hold them open when not in use. Our ProTech groundsheets attach to the tent with a zipper and are made of are thick, thermally welded, rip-stop PVC (650 gr/m² or 19.17 oz/yd²). Completely water and vapor impenetrable, the ‘bathtub style’ floor rises 4 inches high to keep you dry even in standing water. Using a heavy duty size 10 zipper to attach the sidewall to the groundsheet, you can unzip the floor to roll up the canvas walls for maximum ventilation, or remove the groundsheet entirely for transport, storage, cleaning, or to enjoy the grass or sand beneath your feet. A tail gate style system of secure hooks and loops allows you to drop the bathtub wall near the door and peg it flat to prevent tripping and facilitate easy cleaning. A small gap between the two zippers in the back allows an electrical cord to enter the tent without compromising protection from rain and bugs. The Sibley 300 ProTech includes a sewn in no-see-um mesh door in addition to the traditional canvas door. The tent is equipped with loops on either side of the enterance to neatly tie back the doors when not in use. First time set up is a breeze with the Pro’s 5mm guy lines which are pre-attached to the tent and threaded through our tensioners. The Pro grade guy lines have been upgraded with corded nylon rope to make adjusting tension easy and holding taught for long periods of time . Pro guy lines have an additional UV resistant treatment to protect against the suns harmful rays. Plastic tensioners prevent edges from cutting into the guy lines and prolong the life of your tent. Every Sibley comes complete with windows and vents covered in no-seeum mesh to keep the bugs out while providing ventilation and airflow. Our half moon windows have zip up covers to allow you to customize your desired level of ventilation and privacy. Each window is equipped with loop fasteners to neatly hold the covers when the windows are unzipped. There are 3 windows and 3 vents on the Sibley 300. 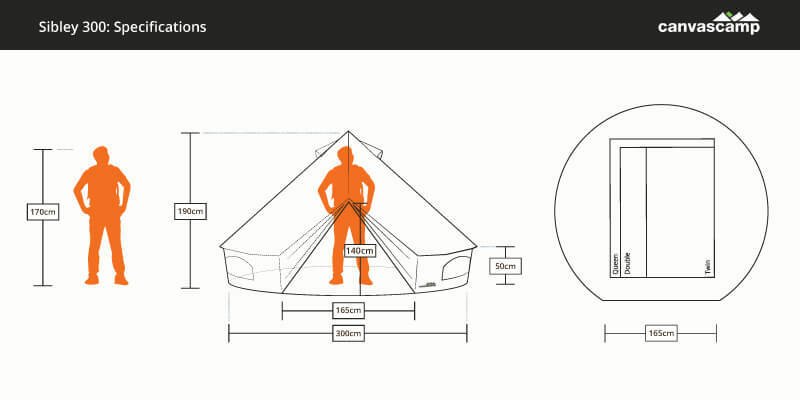 All CanvasCamp tents are easily adaptable for use with a wood burning tent stove. The Gstove is the perfect size to fit the Sibley 300. Proper stove placement is dependent on stove size, tent size, flu exit style, desired temperature, and the environment you intend to camp in. One size fits all, pre-installed stove jacks fail to provide customers with the level of customization necessary to achieve ideal stove placement and maximum utility. To ensure proper placement and ideal efficiency, CanvasCamp offers modular stove jacks (sold separately) that can be easily installed in any cotton canvas bell tent in just a few minutes. Stove jacks are available in a variety of shapes and sizes so you can choose the jack that fits your tent and stove perfectly. Check out our page on How to Install a Tent Stove Jack or contact us to learn more about the best stove and placement for your specific application.